It is important for family and friends to gather together to discuss and reflect upon their experience after a congregation visit. 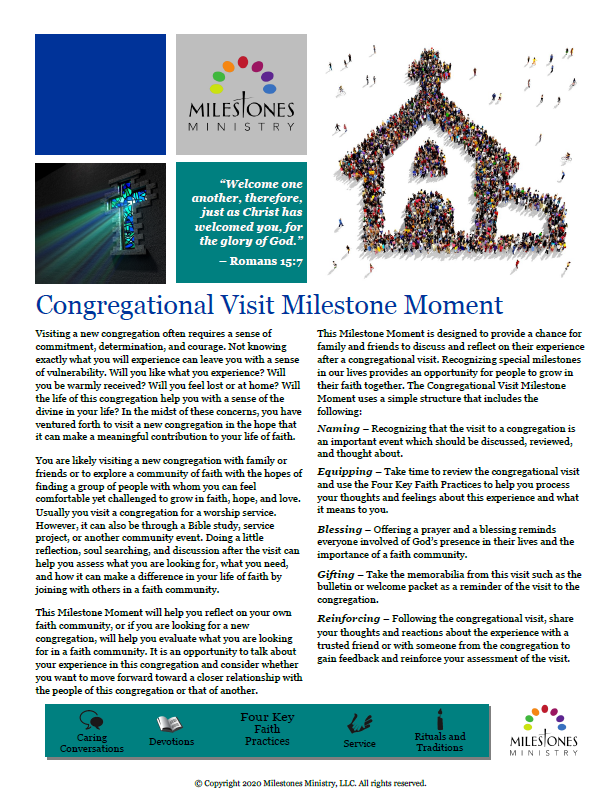 This Congregational Visit Milestone Moment supports this important event and provides an opportunity to talk about the visit experience and consider whether you want to move forward towards a closer relationship with the people of this congregation or that of another. Visiting a new congregation often requires a sense of commitment, determination, and courage when meeting a new and different faith community. This milestone moment encourages reflection and caring discussion about the visit experience and helps one assess what they are looking for, what they need, and what can make a difference in their life of faith. These faith community stones are individually hand-crafted and available at a low cost to purchase and gift as meaningful reminders of this Milestone Moment. They are wonderful keepsakes to remind the congregational visitor of their time with the congregation and that God is with them as they consider joining others in a faith community.